In addition to the anniversary sets which capture most collector attention, the United States Mint has also released other numismatic products containing Silver Eagles over the years. The products discussed here contained either a proof, bullion, or collectible uncirculated version of the Silver Eagle along with other coins or notes in special packaging. In 1993, the US Mint offered The Philadelphia Set, which was issued to commemorate the 200th anniversary of the striking of the first official U.S. coins at the Philadelphia Mint. This special set included each of the Proof American Gold and Silver Eagles struck at the Philadelphia Mint and containing the “P” mint mark. The 1993-P Proof Silver Eagle was included in the set along with the one-half ounce, one-quarter ounce, and one-tenth ounce 1993-P Proof Gold Eagles. 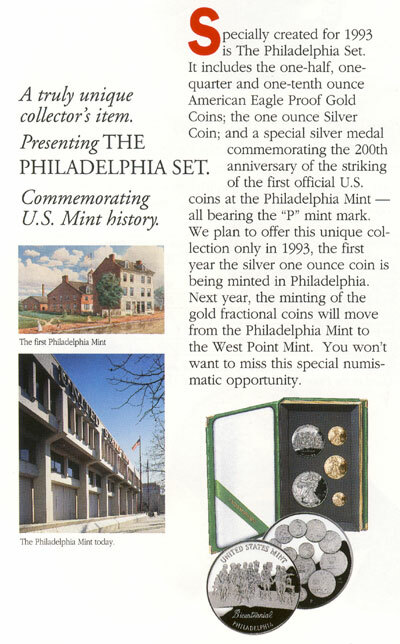 Also included was a silver Philadelphia Bicentennial Medal, which specially produced for this numismatic product. Originally offered at $499.00, the Philadelphia Set recorded total sales of 12,689 units. To mark the launch of the new American Platinum Eagle bullion and collector coin series, the US Mint offered the 1997 Impressions of Liberty Set. This set contained the one ounce 1997-W Proof Platinum Eagle, one ounce 1997-W Proof Gold Eagle, and one ounce 1997-P Proof Silver Eagle. Adding some special allure to the set, production was limited to just 5,000 units, which were individually numbered. The serial number for each set was engraved on a brass plate affixed to the wooden display case. These sets were priced at $1,499.00 each and achieved final audited sales of 4,965 units. 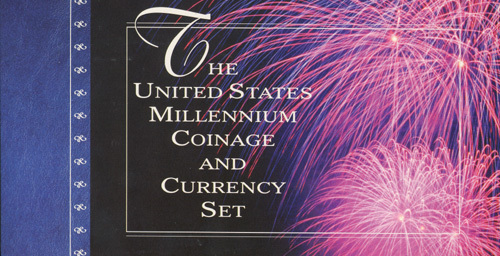 Next up was the Millennium Coinage and Currency Set, which was offered in the summer of 2000. Each set included one 2000-D Sacagawea Dollar, one 2000 American Silver Eagle bullion coin, and a $1 Federal Reserve Note. There were unique aspects for each of these, with the Sacagawea Dollar found to have a special burnished finish, the Silver Eagle identified as produced at the West Point Mint although it did not carry a mint mark, and the note having a serial number beginning with “2000”. These sets were limited to production of 75,000 units and priced at $39.00 each. A rapid sell out was achieved, mainly due to excitement about the burnished dollar coins included. In 2004, the US Mint worked with the Royal British Mint to create a numismatic product containing the silver bullion coins from each country. 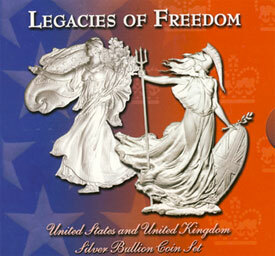 The Legacies of Freedom Set contained one 2003 American Silver Eagle bullion coin and one 2002 British Silver Britannia bullion coin. The two coins were placed in special packaging which highlighted the importance of the two national icons. Priced at $49.99 per set, there was a maximum product limit of 50,000 units. A new annual product was created which would contain uncirculated versions of the various $1 coins along with the collectible uncirculated American Silver Eagle. The Annual Uncirculated Dollar Coin Set was first offered in 2007. 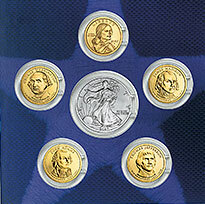 Each set included the four 2007 Presidential Dollars featuring George Washington, John Adams, Thomas Jefferson, and James Madison, the 2007 Sacagawea Dollar, and the 2007-W Uncirculated Silver Eagle. In the following year, the set was offered containing the 2008-dated coins. For 2009, 2010, and 2011 the product was not offered, with the initial cancellation related to the shortage of silver eagle bullion coins. The product finally made its return in 2012 with redesigned packaging. 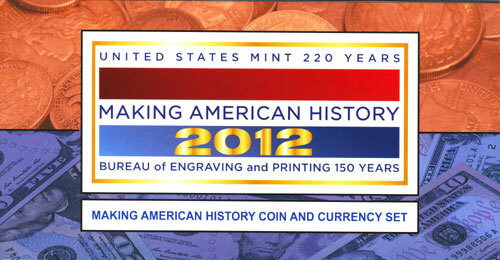 Recently, the US Mint offered the 2012 Making American History Coin and Currency Set to celebrate 220 years of the United States Mint and 150 years of the Bureau of Engraving and Printing. The release of this set closely followed the San Francisco Silver Eagle Set and included the 2012-S Proof Silver Eagle. The set also contained a $5 note with a serial number beginning in “150”. The sets were priced at $72.95 with a maximum possible production of 100,000 units based on the availability of notes. The final audited mintage would reach 56,857 sets. 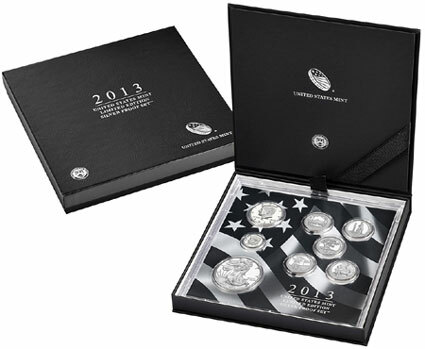 Also for 2012, the first Limited Edition Silver Proof Set was offered, representing a new upscale annual set product. Each set contained the 90% silver versions of the year’s five America the Beautiful Quarters, Kennedy Half Dollar, and Roosevelt Dime, along with the standard annual Proof American Silver Eagle. For the two years of issue, the special set incorporating these coins has been priced at $149.95 and limited to 50,000 units. Starting in 2013, the United States Mint Congratulations Set was offered, as part of a new line of products targeted towards gift giving occasions. This set included the standard annual Proof Silver Eagle within specially designed packaging which allowed a personalized message to be written the recipient. Despite slow sales, the product was offered again in the following year, creating another new annual offering. In 2016, the United States Mint issued the Ronald Reagan Coin and Chronicles Set. 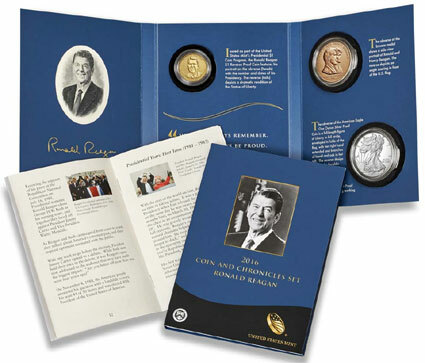 This product included the 2016 Ronald Reagan Presidential Dollar struck with a reverse proof finish, the 2016 Proof American Silver Eagle, the Ronald and Nancy Reagan Bronze Medal, a presidential portrait produced by the Bureau of Engraving and Printing, and an informational booklet. The set was priced at $68.95 and limited to production of 150,000 units. While similar sets had been issued for other Presidential Dollars, this set was the only one to contain a Proof Silver Eagle. This coin was included to acknowledge President Reagan’s role in supporting and signing into law the Liberty Coin Act (Public Law 99-61) which authorized the American Silver Eagle coin program. The 2016 Proof Silver Eagle is also notable as carrying a plain edge with incused lettering “30th anniverary” to mark the milestone within the program.